A forest-to-be of redwood trees and red-berried toyon shrubs sprouted on a hillside near Lawrence Hall of Science over the weekend, thanks to the hard work of 100 volunteers from the UC Berkeley campus and community. The saplings are native species, and were planted to replace a stand of eucalyptus trees that represented both a critical wildfire threat and a non-native incursion into the local ecology. Among the volunteers was Lois Wareham, a Berkeley resident and a user support supervisor for University Health Services. She brought her daughters, 8-year-old Lizzie and 11-year-old Kate, to devote their Saturday morning to lugging pots and digging holes. “To me, redwood trees equal California,” says Wareham. “It is a rare and wonderful opportunity to get to participate in the planting of so many trees. “Sharing the spirit of community, hard work and the importance of supporting the native plant life with my children was the icing on the cake,” she adds. The planting came about with assists from multiple UC Berkeley departments and was organized by James Sanner, a grounds manager for the Recreational Sports Department and a member of the campus’s fire mitigation committee. The committee had identified the eucalyptus trees as a serious fire hazard because their high oil content makes them quick to ignite and produces towering flames that cast burning embers far and wide, Sanner says. The trees were felled last September and ground up and returned to the soil, leaving a bare slope. The seedlings, 200 redwoods and 100 toyons initially donated by the College of Natural Resources, had been nurtured for a couple of years in a lath house at the Richmond Field Station, with help from the College of Engineering. 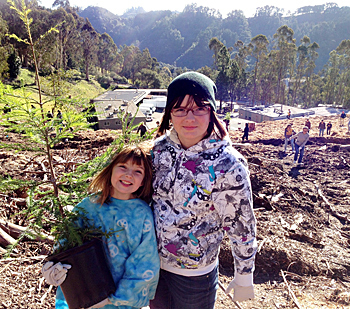 Staff from the Lawrence Hall of Science and Rec Sports helped pull the planting together. On Saturday, the volunteers and 10 LHS and Rec Sports staff gathered to put the waist-high redwoods and toyons into the ground. By midafternoon, 300 small green spots dotted the hillside, and all had received a splash of water, according to Sanner. Sanner says the redwoods are “fire-adapted,” and by replacing the eucalyptus reduce the fire threat from “catastrophic” to “controllable” in a populated hill area that has proven vulnerable to fierce wildfires in the past. The native species also have the potential to reawaken the natural ecosystem and encourage the diversity of native insects, he says. In addition, redwoods have great carbon-storing capacity. “So as a result of a great group effort, we can all be glad to know we benefit from a safer urban-wildland interface and that our local environment is healthier and more sustainable,” says Sanner.